A good children’s librarian is never satisfied. Never content with his or her lot. It doesn’t matter how many great read aloud picture books we’ve culled for our storytimes. Like Captain Ahab we’re on the search for "the one". That great picture book that’ll leave ’em dead in the aisles (not literally . . . that would be a bit dark). We prowl the ALA Conventions, hunt the bookstore shelves, and sniff through professional journals never stopping, never ceasing. Our work is never done. In the course of my own searching, I stumbled on a little book of no extraordinary physical note. Jump! by Scott M. Fischer sits quietly on a shelf. No spangled doodads or pop-up whizbangs explode when you open it. No tinny tunes or scanimation wonders draw you in. It has words. It has pictures. It has pictures with words. It also has a beat and you can dance to it. Find yourself cornered at a three-year-old’s birthday party and you have to read them something fun? Heading up your library’s next toddler storytime and you need a book to get a crowd riled? Grab yourself some Jump! then, my friend. It’s hep. It’s hopping. It’s happening to boot. This is one of those books where I’m going to advise the grown-ups to read it first before you attempt to speak it aloud to someone else. It isn’t a difficult read in the same way a Dr. Seuss book can be, but there is an internal rhythm to it that you have to get down before you can make it sound natural. One storytime suggestion: Get the kids you’re reading this book to to jump high into the air every time you get to another character jumping. That, I suspect, will go over like gangbusters. Failing that, get ‘em to scream the word along with you. I’m a modern librarian. Screaming in the library’s perfectly fine, as long as it’s aimed at a book. Fischer originally wrote the book as a song, which may account for some of the wording. At first I thought that Fischer was being inconsistent with his rhymes, but then I detected a pattern. The rhymes go bug/bug/jug, frog/bog/log, cat/cat/mat, hound/hound/sound, croc/dock/rock, shark/dark/shark, whale/sail/tale. With the exception of the hound and the shark rhymes, there’s a definite pattern here, that isn’t immediately apparent. A kind of A/A/B, A/B/C, A/A/B, A/B/C rhyme scheme. Unfortunately the hound and the shark kinda throw it out of whack. Not that you’ll care when you’re reading it. Not that kids will care when they’re hearing it. But this may date back to when the book was a song in its first incarnation. Now I began this review by saying that the cover doesn’t immediately leap out at you (no pun intended) but that’s not strictly true. True, it isn’t augmented with a fine layer of pink patterned sprinkles and sequins, but there’s something pleasing about it. Fischer isn’t afraid of a pure white background. His characters are all painted in thick watercolors of various shades and hues. 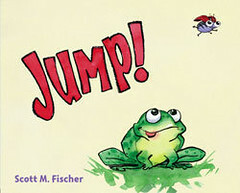 The cover is a good example of this, its bright green wide-eyed froggy staring up at the little purple and red bug hovering above its head. Characters in this book are big and bold and will read just as well across a crowded room as they will in one-on-one bedtime storytimes. Particularly when you turn the page for the horizontal shark/whale JUMP sequence. I also appreciated Fischer’s sense of scale. The last two two-page spreads show all the animals in the air at once, but to get them to be approximately the same size Fischer has the bug placed closest to the reader, with the other animals falling in the distance behind. Not all songs are natural picture books. You might love “I’ll Sing You One-Oh” but trust me, a 32-page readaloud it does not easily make. Sometimes you get lucky, though. Sometimes you’ll run across just the right book. Jump! is going to make a big splash in my upcoming storytimes, and I doubt not that in libraries, classrooms, and living rooms across the nation folks will have much the same reaction that I had to it. After all, a picture book’s not much good unless it has a load of pep. And pep this book has. Look for it. Source: Hardcover copy sent from publisher. For a while there this book was a potential Cheerios Spoonfuls of Stories promotion where, if it won, a copy of JUMP would be placed on cereal boxes nationwide. Scott created a mess of funny videos for the occasion. You can see them all here. Did you know he was the artist behind the Emily Ecton books like Boots and Pieces too? Who knew? C’mon, c’mon… Time for Newbery/Caldecott predictions. Time is short. Only two more weeks. Patience, patience. We can’t rush these things . . . This looks awesome! I hope my library buys it–I want to try it out on storytime soon.